This coming Monday, Feb 8, is the start of the Chinese New Year. For those of you not acquainted with the Chinese New Year, it follows a lunar calendar and has a 12 year cycle with each of the 12 years named after an animal. Ex: 2005 was The Year of the Rooster, so next year the cycle will start all over again with the Rooster. It cycles through from Rooster to Monkey (or any variation depending on which year you start counting), and includes, among others, the Year of the Dog, Ox, Tiger, Dragon etc. 2016 is the Year of the Monkey. By strange coincidence, 1968 was also the Year of the Monkey. 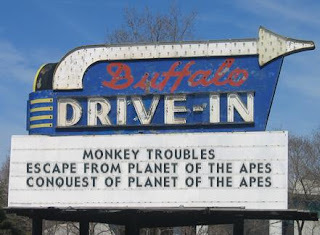 I say "strange coicidence" because 1968 was also the year that the first Planet of the Apes appeared in theaters. Yes, the start of a franchise that included 5 original movies, a short-lived live action TV series, and a cartoon show, also short-lived, indeed began in the Year of the Monkey. I think that it's just kismet, therefore, that , having just bought the DVD set of the TV series, and, already having the original 5 movies, that I should celebrate the new Chinese New Year with a series of blog postings on that incredible franchise. 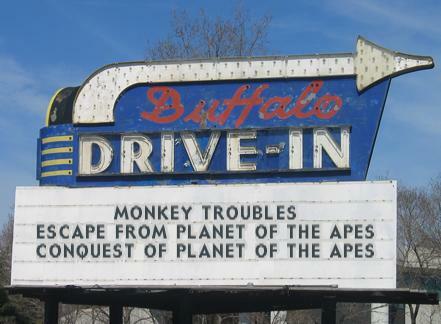 The studio execs knew a gold mine when they saw one, and the Planet of the Apes was a definite gold mine. The first two movies had done phenomenally well. The problem with continuing the series was problematic, however. 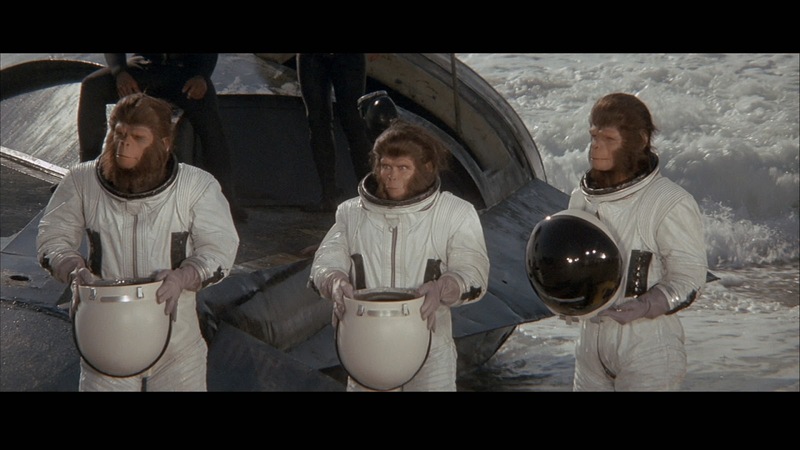 In Beneath the Planet of the Apes, the planet had been blown up by a Doomsday bomb, which rendered any more future on the planet impossible. But execs were adamant, and Paul Dehn, writer of the first sequel, was commissioned to do the next sequel. 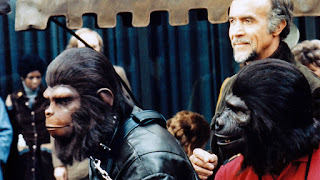 The budget problems of ape makeup was solved by transporting three apes from the original planet back in time to the (then) modern day United States. 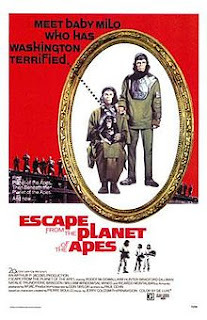 A side note : If you have paid attention during the last two entries in the series, you will immediately remember that a) the ape society had guns, but only horses for transport, not even primitive prototype cars, and b) that Cornelius stated in the original movie that flight was an impossibility. So how did these three obtain a spaceship and get to Earth? The apes are taken to a special room at the LA zoo where they are put under observation. Drs. Branton (Natalie Trundy) and Dixon (Bradford Dillman) run several tests on the apes, not yet aware that they are intelligent and can speak. They assume that the apes were somehow taught how to fly by a superior race, and were just like what would normally be expected of simians in modern-day. 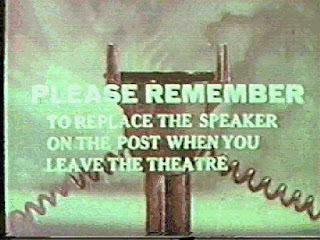 But during one test, Zira, frustrated, reveals she can speak. Our scientists are astounded. Not long after, Dr. Milo is killed by a gorilla in the neighboring cage. Cornelius and Zira form a friendship with Drs. Branton and Dixon. 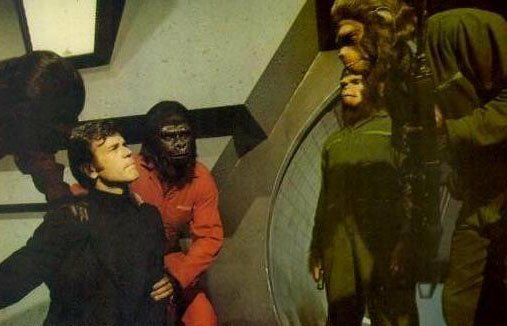 The ape doctors are taken before a Presidential commission where they reveal that that can indeed speak. They become celebrities, buying current fashion clothes, being photographed and interviewed by paparazzi, and immersing themselves in the culture of the day. Meanwhile, however, a Dr. Hasselein (Eric Braeden), who has the ear of the President becomes wary and suspicious of the apes from the future, wondering how they became intelligent. He gets Zira drunk on "Grape Juice Plus" (wine), to the point where she reveals some information that makes him even more wary. She tells him the way the world ends (see the ending of Beneath the Planet of the Apes), as well as the experimentation she did as an animal doctor (humans being considered animals, much the same way modern doctors considered apes). He uses his influence to convince the President to prevent the birth of Zira's baby (they don't come right out and call it abortion, but it is), and to sterilize the two apes to prevent any more intelligent ape births. 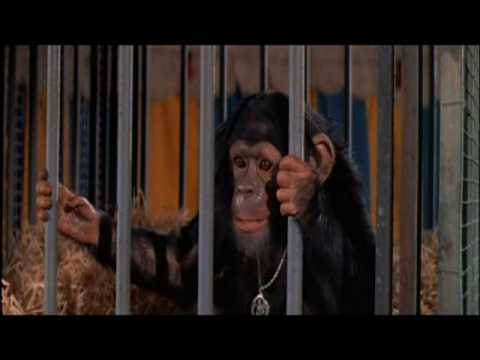 Cornelius and Zira escape from the cell where they are being detained, and are on the run. Fortunately they meet up with their human doctor friends who convince a local circus owner, Armando (Ricardo Montalban) to hide them. But eventually they are discovered. Escape's political message is a bit more subtle than some of the others, but it should be clear that tolerance of people who are different is a major theme. At least the political theme doesn't beat you over the head as it did in the next sequel in the franchise. The next installment takes place some 18 years after Escape. In the society Armando (Ricardo Montalban) is still a circus owner and he takes Caesar, led by collar and leash, around distributing flyers for his circus. In this society, apes are servants (slaves) who have been trained to do menial tasks. Caesar does not reveal he can talk except when alone with Armando. Early on it is revealed that Caesar is the son of Cornelius and Zira, all grown up (albeit not named Milo, as Zira had wanted at the end of the last movie). Caesar is played by that king of the POTA movie cast members, Roddy McDowell, again. There are no punches blocked or holds barred in the political agenda of Conquest. The message that slavery is bad is used like a baseball bat to beat you into submission, much like some of the humans use billy clubs in the movie to beat apes into submission. As a result, this sequel I think is by far the worst of the four. 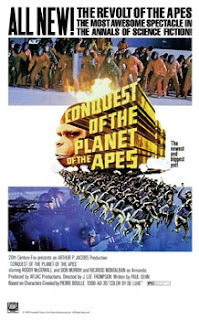 Of course there had to be a logical sequence for the apes to have gained control by the time of the first film, and there is nothing logistically wrong with the layout of this timeline, but I felt like I'd been three rounds with Mike Tyson by the time the movie was over. Caesar and Armando see an ape being beaten and Caesar, forgetting he is not supposed to let people hear him talk, yells "Lousy human bastards!" The cops hear it and approach Armando, but Caesar keeps quiet and Armando says it was really him that yelled the epithet. The two manage to get away with it, but Armando tells Caesar that he, Armando, will have to turn himself in, and that Caesar should disappear among the incoming apes at the harbor. Caesar ends up on the auction block and is bought by the Governor (Don Murray). He ends up in the archives room doing filing work, where he meets MacDonald (Hari Rhodes), a black man who is sympathetic to him in his slavery. In contrast, it shows the interrogation of Armando by Kolp (Severn Darden) trying to illicit a confession of complicity in hiding the baby of Cornelius and Zira. The interrogation tactics are rather tame, but a lie detector machine is brought in to verify Armando's false story and rather than submit he commits suicide. Once Caesar hears of his friend's death, he becomes even more committed to change the situation with his fellow apes. The later third or so of the movie show Caesar fomenting the rebellion, getting his fellow apes to commit acts of insubordination with their masters, and collecting various implements of destruction. This ultimately culminates with a rebellion like the city has never seen before, with cops battling hordes of armed apes, and the governor declaring martial law. 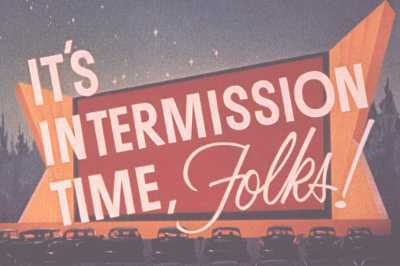 Ultimately. of course, the apes succeed in their rebellion, leading to the final scene in which Caesar grants the governor a stay of execution and declares this to now be "the planet of the apes!". Well, that's the end of this session. Come back Monday for the final installment and celebrate the new Year of the Monkey with me. In the meantime it's time to take the old Plymouth home. So long from the back seat. Conquest is extremely bloody and violent, even more so than the original, but it is exciting. And I am a fan of the versatile Ricardo Montalban...so this is fun to watch for me too. 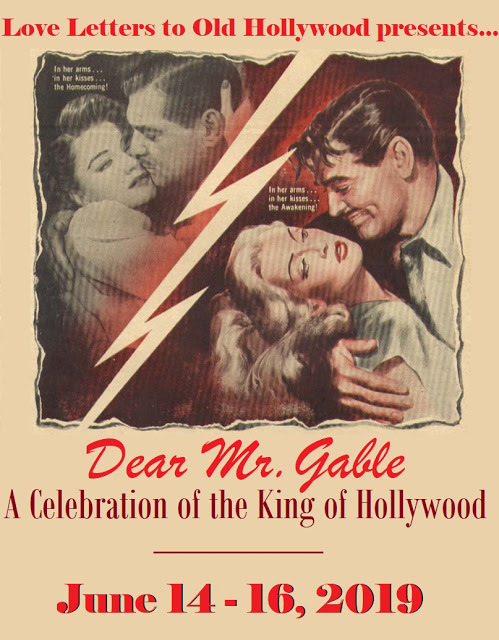 Natalie Trundy was the producer's wife, so she's in all but one of the films. As an ape in Conquest, if I remember...I think I need to marry a producer myself!! So freaky that 1968 was also the Year of the Monkey...I wonder if that was by design? Thanks for the simian memories, my friend!! 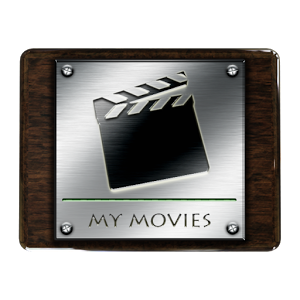 It's hard not to reveal an ending of one movie when you're segueing into a sequel which has elements from the previous entry that are integral to the follow-up. 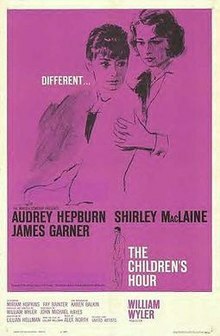 But I do try not to reveal endings unless, like the end of the original, there could hardly be anyone over the age of 12 who hasn't seen a reference to it at some point in their lives. 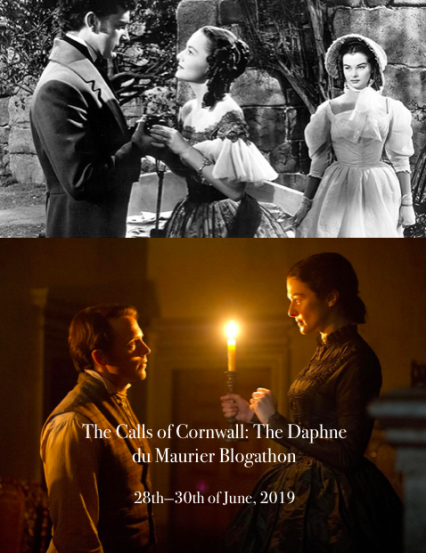 Great analysis of these fabulous films. Indeed, the fact that the stone-age apes could salvage the rocket ship and travel backwards in time is far-fetched, but it's so much fun, who cares? I think it's time to set aside a weekend for a Planet of the Apes marathon!